“I was into surfing from a young age. I used to listen to The Beach Boys, and watch surfing films like ‘Point Break’ and ‘Lassie Come Home’, all the time. 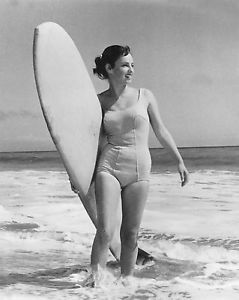 My experiences actually surfing was limited though, living, as we did, in County Carlow. We were a fair bit from the oceans, but there was a little pond near our house, and we’d get oul’ boards, or broken-off doors, and pretend they were surfboards, but, the water was only 18 inches deep. There was no wind or waves or nothin’ either, so normally you’d just be standing there in the water lookin’ like an oul’ eejit. The pond, seemingly, had also been used as a burial ground by a local Pagans group, for their deceased animals. So, you might fall off your pretend surfboard and land on an oul’ drowned pony or something. So, it wasn’t very nice. We moved to Connecticut a few years back, there’s still hardly any surfing, and most of our neighbors give us funny looks when we jump into the lake attached to an oul’ broken door, but f*ck them, they’re only bastards anyway”. – Dorothy (32), formerly Carlow, now Connecticut. ← “Humans of Irish America” – Jackson’s Story (Kerry).